I never realized I was missing a prequel, a back story to Peter Pan, until I read this one, and thought, yes, of course I want to know why Peter Pan can fly, never grows old, and can talk with fairies! At the same time, this prequel is really not of the same genre as the cleaned-up Disney movie Peter Pan. (I never read the original children’s book.) It’s an action packed pirate story, with lots of fights, heroes, and drama. At the same time, it’s got a wonderful element of magic in it – the power of stardust from the heavens. The writing in this children’s book is well-done, using great images, sprinklings of humor, and great imagery. While there is a fair amount of fighting, none of it is terribly gory nor scary, making the children’s book exciting rather than frightening. It also is very subtle in the way we discover the little bits of information that are revealed in the full Peter Pan. 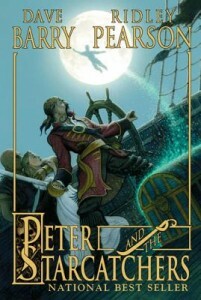 There are two more children’s books in this series about Peter, though I am not drawn to read them. I have a slight concern they may get a bit darker. And all my need for knowing where Peter Pan and Tinker Bell originated are completely satisfied. I’ll stop here, and give this children’s book a fine recommendation. Great for boys who might be drawn to pirates.